Employers celebrate the launch of the hub. 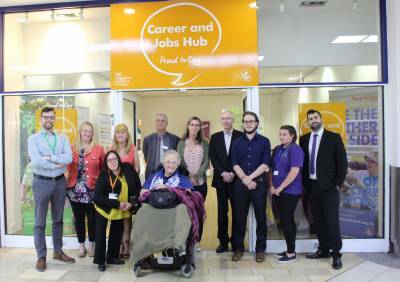 This week Bristol’s Proud to Care Campaign celebrated opening a Career and Jobs Hub in the Galleries. The hub will be open every Wednesday-Friday, 10am-2pm for an initial trial period of seven weeks and is located on the ground floor, near the Broadmead entrance. 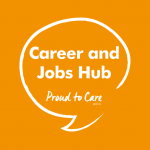 It’s designed as a one stop shop for jobs and careers information with opportunities to meet employers face to face and get an idea of what it means to work in the care sector. There are a wide range of opportunities available, from direct care and support roles to specialist and management positions. The hub, which is a partnership between Bristol City Council and the Department for Work and Pensions, will also provide general, impartial careers advice and showcase a range of opportunities from other sectors. It’s supported by a weekly rota of local care employers including Bluebird Care, Brandon Trust, Care 1st Homecare, Freeways, Medacs, Milestones Trust, Right at Home, Shaw Healthcare and WECIL.